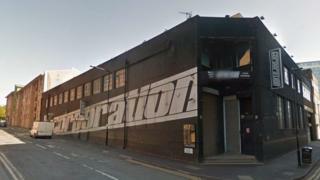 A man has been arrested hours after a teenager was stabbed in a nightclub in Sheffield. The 18-year-old was inside Corporation, a live music venue and rock club on Milton Street, when he was stabbed in the chest at about 01:00 BST. He was taken to hospital where he is said to be in a serious condition. On Tuesday afternoon South Yorkshire Police confirmed a 21-year-old man had been arrested on suspicion of attempted murder and was being questioned. South Yorkshire Police said there were about 800 people in the club at the time and urged anyone who saw anything to contact the force. Det Insp Jamie Henderson said: "The circumstances surrounding the incident are under investigation and officers are reviewing CCTV and working with the club. "The managers of Corporation took the decision to close the premises immediately after the incident and a review is currently underway with our licencing officers."